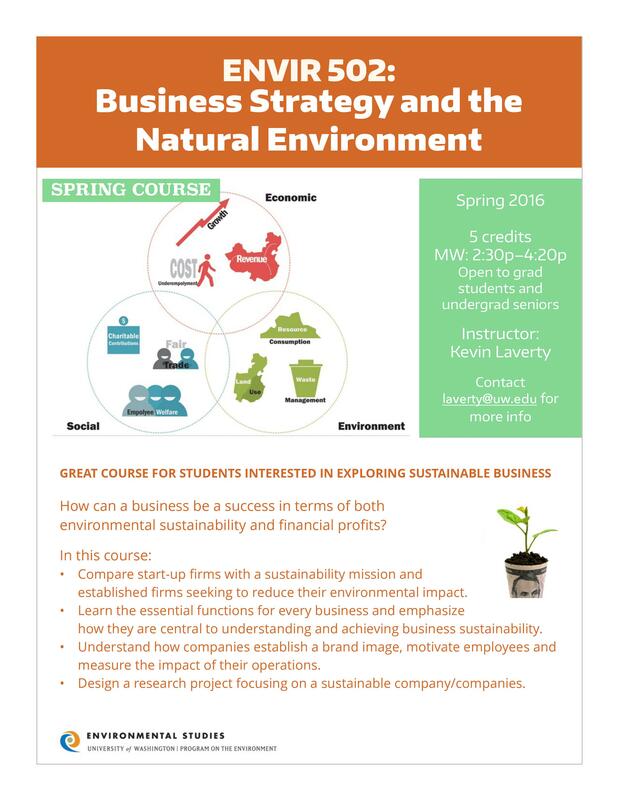 Thinking about what’s available for Spring courses? 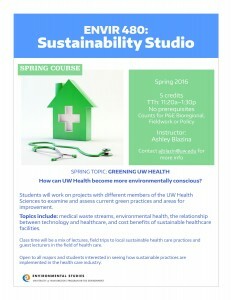 Check out our Environmental Studies Spring offerings. Registration starts Feb. 12! 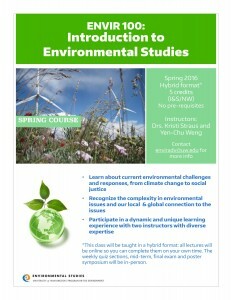 ENVIR 100: Introduction to Environmental Studies – Great course for exploring environmental majors. Learn about environmental issues in a local and global context. 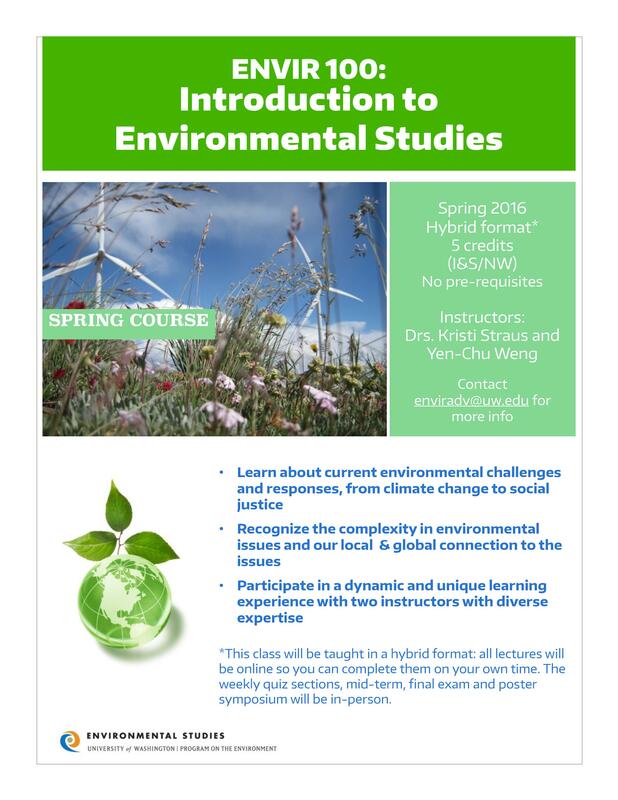 The Spring course is in hybrid format. 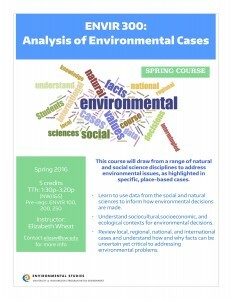 ENVIR 200: Communication for Environmental Studies – Develop the skills necessary to engage, analyze, write, and speak about complex environmental issues in a variety of disciplinary contexts with particular values and emphases. Course restricted to Environmental Studies majors. 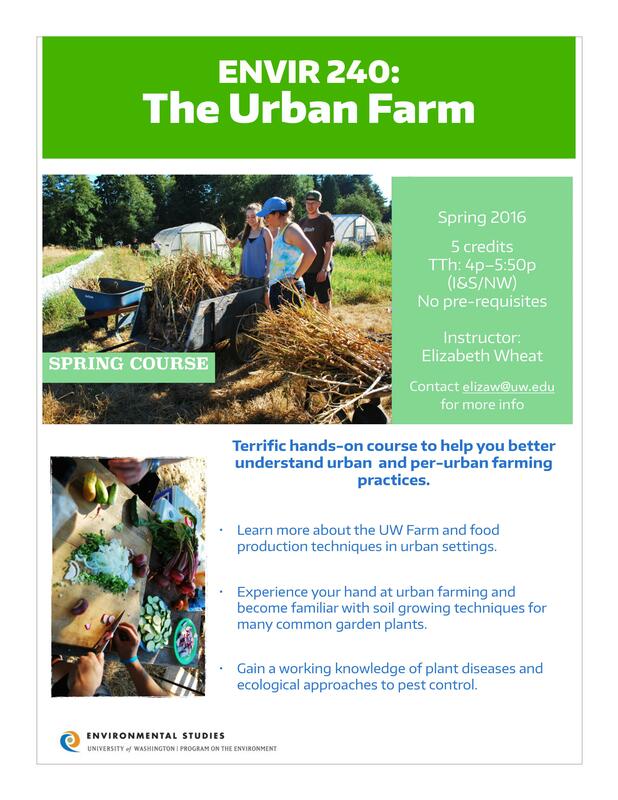 ENVIR 240: The Urban Farm – CLASS FILLED. 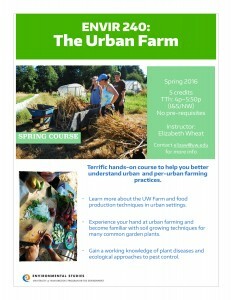 Learn about the UW Farm and food production techniques in urban settings. 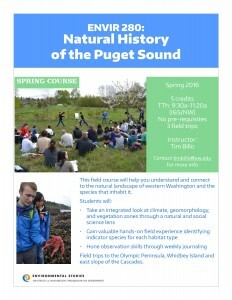 ENVIR 280: Natural History of the Puget Sound – CLASS FILLED. 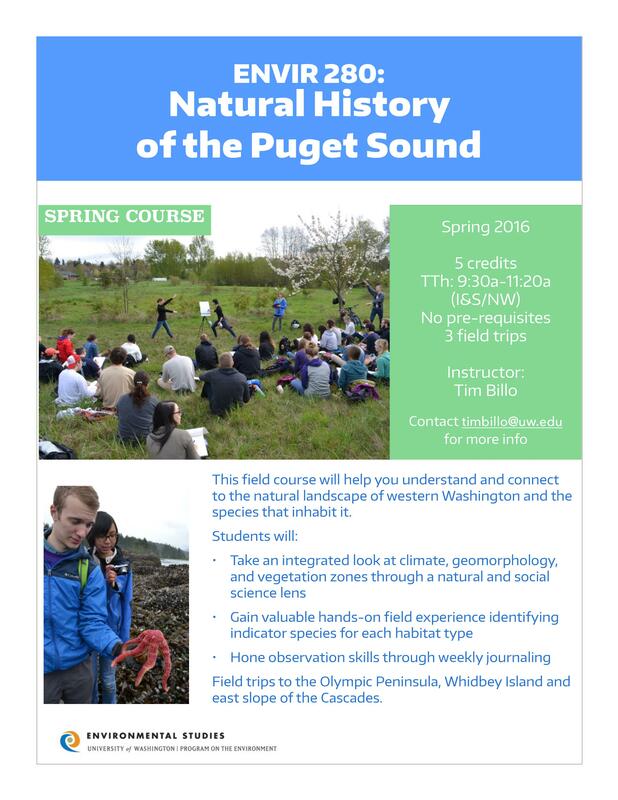 Explore and understand the landscape of Western Washington and the species that inhabit it. Field trips to the Olympic Peninsula, Whidbey Island and east slopes of the Cascades. 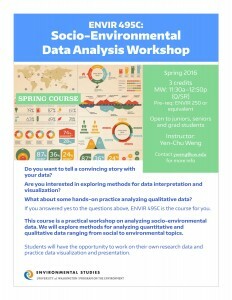 ENVIR 300: Analysis of Environmental Cases – Learn to use data from the social and natural sciences to inform how environmental decisions are made. ENVIR 480: Sustainability Studio – Focus on how to make UW Health services more green; analyze and visit real-world examples of green healthcare providers. 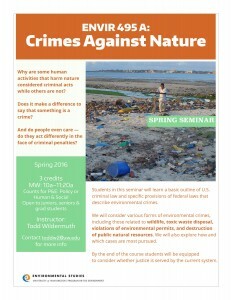 ENVIR 495A: Crimes Against Nature – Examine why some human impacts that harm the environment are considered criminal acts, while others are not. Review relevant case studies to understand the current system. 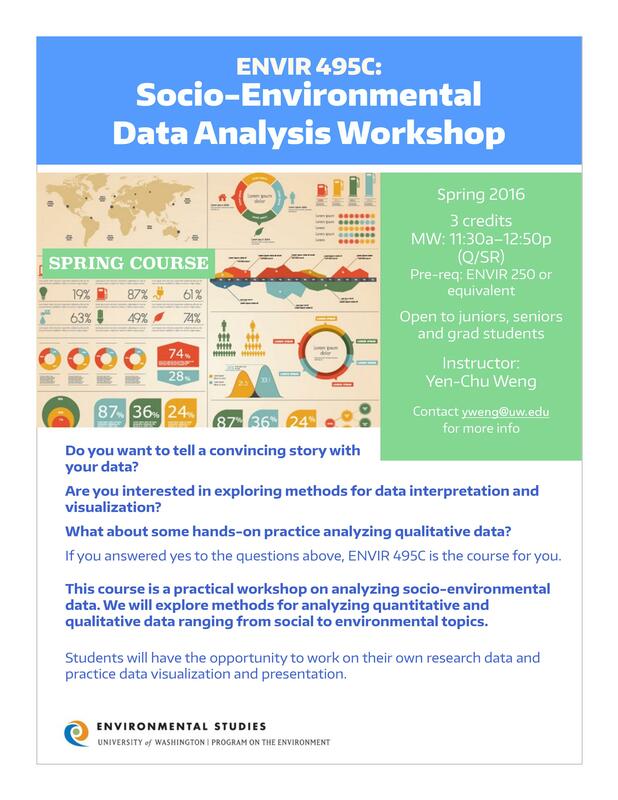 ENVIR 495C: Socio-Environmental Data Analysis Workshop – Learn how to tell a convincing story with your data and apply methods for data visualization to present your own research data. 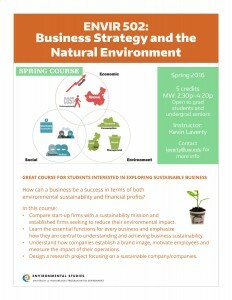 ENVIR 502: Business Strategy and the Natural Environment – Great course for students interested in sustainable business. Review essential functions for achieving sustainability in start up and established firms. Open to undergraduate seniors and grad students.